An horrific display of unfounded jealousy and spousal abuse has left a 28-year-old mother of three dead in Bangkok, her estranged husband in police custody facing a lengthy prison sentence, and their three children parentless after a frenzied knife attack in the Thai capital Bangkok. According to the Royal Thai Police (RTP) 38-year-old former truck driver Jaipuk Onchan went to the Big C Supercenter in Phra Pradaeng District of Samut Prakan Province, an outer suburb of greater Bangkok, to confront his estranged wife, 28-year-old Jinkanya. Police said the couple had been separated for ten days after a six-year-long relationship which had seen three children born over its course. Mr Onchan is said to have been trying to reconcile the couples difference but the situation quickly grew violent when his wife, who worked as a product demonstrator at a Ponds cosmetic store rebuffed him. He then grabbed her in a headlock before pulling out a knife. As horrified shoppers looked on Mr Onchan commenced a frenzied attack on his wife, stabbing her repeatedly in the abdomen and shoulder. Initially stunned shoppers leapt into action to separate the pair, with Thai police saying at least two of the would-be rescuers suffered injuries during the take-down. 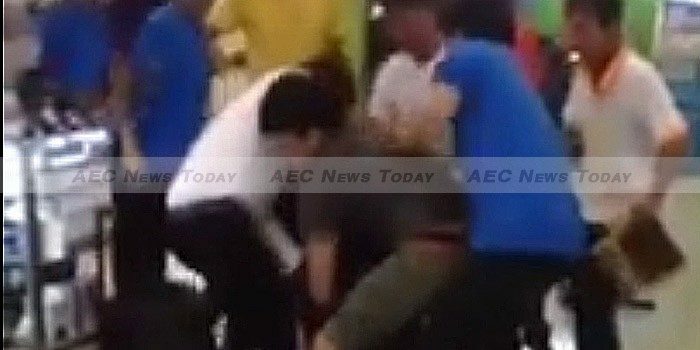 In the video above shoppers physically restrain the man while waiting for Thai police and paramedics to attend as poorly trained and equipped shopping-centre staff and security officers can be seen milling around the injured woman with no idea what do, despite the attack happening close to a supermarket selling towels and medical supplies. The closed circuit television (CCTV) vision below captures the attack, along with the rapid response of bystanders, one of whom used a chair to take down Mr Onchan after first trying to tackle the man. Despite being transported to a nearby hospital for emergency surgery for multiple stab wounds Ms Jinkanya was reported to have died on Wednesday evening. Mr Onchan is said to have told police that although he loved his wife deeply, he killed her because he thought she was seeing another man. According to some local media reports Mr Onchan has previously served a prison sentence for killing a former wife. Spousal abuse such as this are more common across Asean member countries than many people think, much of it ignored due to religious or cultural beliefs. A 2010 study done by the UN found that a third of married Vietnamese women had experienced physical violence from their husband while the World Health Organization (WHO) says one-in-three woman have experienced either physical or sexual violence from their partner. According to Safe Horizon, a non-profit victim services agency in the USA, one-in-three female homicide victims in the USA are murdered by their current or former partner every year. The editors of AEC News Today extend their condolences to the family, friends and associates of Ms Jinkanya. Update: This is story was updated at 10:10pm on September 12, 2015 to include the CCTV vision of the attack. AEC News Today has opted not to display an additional handphone clip as it contributes nothing to the story. In recognition of the bravery exhibited by the bystanders in subduing, detaining, and handing over Mr Onchan for criminal prosecution as seen in the CCTV footage above we also list this as a Best of the AEC. Are you aware of resources in your Southeast Asian country for spousal abuse victims? Register and post the details in our comment section.